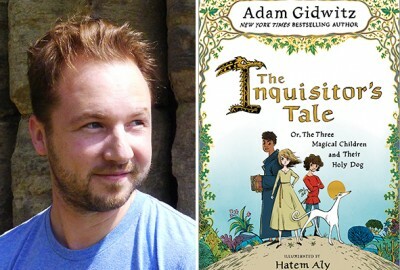 The Inquisitor's Tale: Or, The Three Magical Children and Their Holy Dog, the latest book from New York Times bestselling children’s book author Adam Gidwitz ’00, was awarded a Newbery Honor — one of the highest awards in children's literature — this morning from the American Library Association. Earlier this month, The Inquisitor’s Tale also won a Gold Medal in the Sydney Taylor Book Award’s Older Readers category. Congratulations, Adam! Part fantasy and part adventure, The Inquisitor’s Tale (Dutton Children’s Books/Penguin Random House) is a story of strangers who become unlikely friends while on a quest through medieval France. The book is beautifully illustrated as an illuminated manuscript by Hatem Aly to reflect the time period. Adam is the author of the bestselling children's books A Tale Dark and Grimm (2010), In a Glass Grimmly (2012), and The Grimm Conclusion (2013). His fourth book, The Empire Strikes Back: So you Want to Be a Jedi?, is his retelling of the iconic Star Wars film. Adam will be visiting Park on April 13 as the Gordon Berman ’68 Memorial Lower School Resident Author.